It’s in with the new and out with the old. With Japan winning the bid for the 2020 Olympics, it’s time for a new and improved Olympic Stadium. The old stadium, home of the 1964 Summer Olympics is set to be demolished in 2015. What does all this have to do with music, you ask? A two-night farewell concert event called simply, “Japan Night,” will be held in the old stadium May 28-29. The first night, titled “Yell for Japan,” will feature artists such as Ikimono-gakari, FUNKY Kato of Funky Monkey Babys, and the Gospellers. 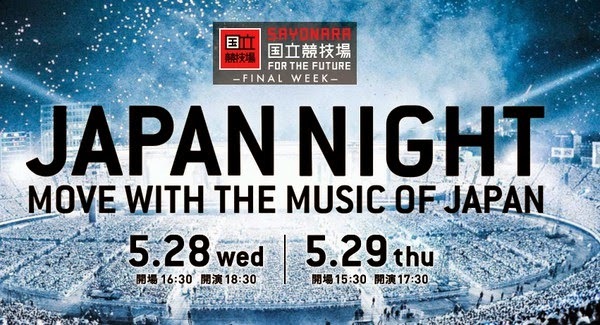 The second night, titled “Japan to the World,” will feature Sekai no Owari, Perfume, Man with a Mission and L’arc en Ciel. Check the homepage for full artist listing and ticketing information. New band announcement: The:Ø! Information on this band is limited and their OHP is little more than a logo and a lineup with the simple statement: 2014 Summer, Initiation. The lineup is exciting though. We’ve got ex-Reeper Saica on vocal, ex-Nega SAN and newcomer Hiroya on guitar, ex-Regalia Nagi on bass and ex-Vior gloire Aru on drums. I look forward to interesting things from these guys. Legendary indie girl-group, SHONEN KNIFE announce US tour dates on the back of their newest release. Titled “Overdrive,” this ten track album with a classic 70’s feel went on sale in the US on 4/15. Their tour will take them through Japan and Europe in the Spring and Summer and the US in the fall. They’ve released a hand full of US dates in September and October and promise more to come. You can purchase the album here and be sure to keep an eye on their OHP for shows in your area. And that’s the Quickie! See you next week!